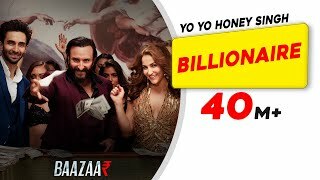 Billionaire song Lyrics from Hindi movie Baazaar. Lyrics of Billionaire is drafted by Yo Yo Honey Singh. Billionaire song is sung by Simar Kaur, Yo Yo Honey Singh. The Album features Saif Ali Khan, Radhika Apte, Chitrangda Singh, Rohan Mehra in lead roles. Lyrics to Billionaire song,Billionaire song translation in english. Aur main hoon tera Kanye..